1. Preheat the oven to 450°. In a large, heavy saucepan, heat the olive oil over medium-high heat. Add the onions, garlic, thyme and 1/2 teaspoon each salt and pepper, lower the heat to medium and cook, stirring, until the onions are golden, about 15 minutes. Stir in the wine and cook for 3 minutes. Add the beef broth, reduce the heat to low and cover the saucepan. 2. 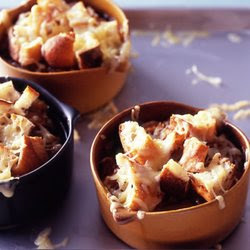 Divide half of the bread cubes among four small ovenproof bowls and cover each with 1/4 cup cheese. Divide the soup among the bowls, then top with the remaining bread and cheese. Set the bowls on a baking sheet and bake until the cheese is bubbling, about 10 minutes.